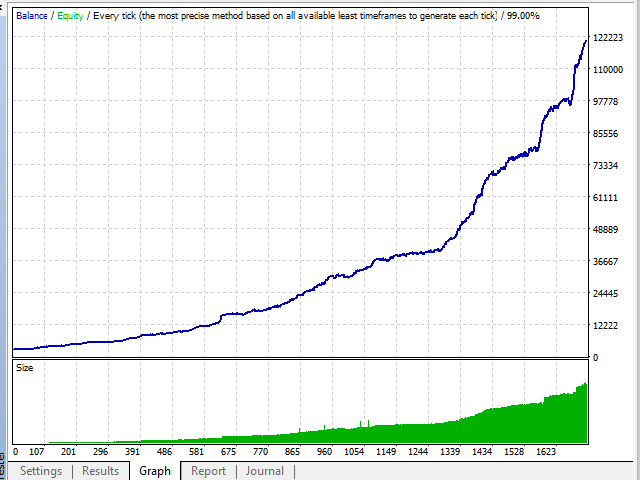 Powerful trading system, combined multiple trading systems at the same time. It is known that the trend trading experts have difficulties during flats, and flat experts in their turn are afraid of trends. This robot is versatile and can operate stably in all market conditions. After opening an order along the trend, the EA is fully prepared for the price to reverse in the opposite direction or to fluctuate in a flat. This systematic approach allows the robot to be as robust and flexible in operation as possible. The EA features a system of collecting statistics and controlling the quality of order execution. The table also contains the average spread value for all the EA operation period as a percentage. Low spread, minimum slippage and good VPS with minimum possible ping are the main criteria for the EA operation. By default, the TimerStop function is disabled. Use this function with caution, preliminary testing its efficiency on a separate account. To compare the results, run two instances of the EA on separate accounts, one using this function and the other without it. Everything is relative. The idea of using this function is that if the price fluctuates in one place for a long time after breaking through a support or resistance level, then there is a high probability that the price will roll back. In order to minimize the losses, the stop order is moved to the minimum allowed distance of the StopLoss parameter. TimerStopLoss - time in seconds, when expired the stop loss order is moved to the minimum allowed distance specified in the StopLoss parameter. StopLoss - The minimum distance to stop orders in points. The distance to stop order is calculated automatically and depends on the <TotalEquityRisk> parameter. If the drawdown percentage is 1%, the deposit $1000 and the entry lot 0.1, then the distance to stop order will be 100 pips. If the lot size is decreased to 0.05, then under the same conditions, the distance to stop order will increase to 200 pips. The distance changes depending on the deposit and the parameters <TotalEquityRisk> and <RiskPercent>. Whatever changes you make in the settings, the robot will protect your deposit and will never allow losses to be greater than the value of <TotalEquityRisk> in a single trade or in the entire series of trades. Among other things, the EA places virtual stop orders invisible to brokers, so with this robot your deposit is undoubtedly protected. 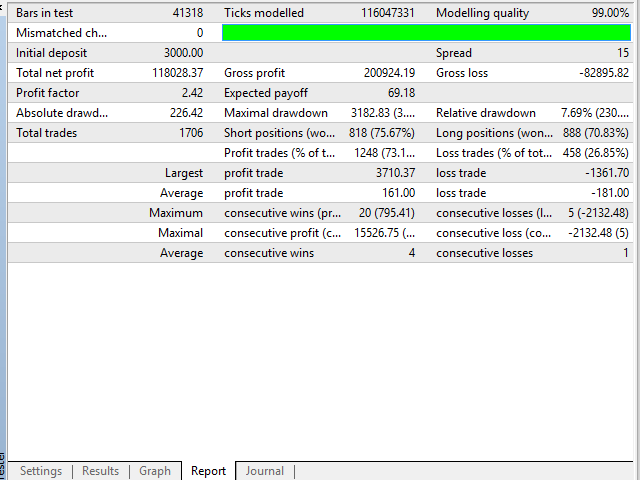 PipStepStop - The minimum distance in points between pending orders, they will not be opened closer that this distance. TotalOrders - The maximum number of pending orders. 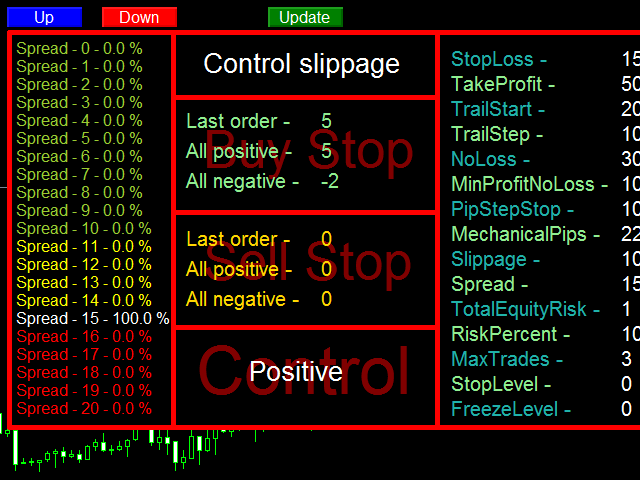 Added the function that allows to modify stop order by the minimum allowed distance of the StopLoss parameter, after a certain time once a pending order is triggered. TimerStop - allow time based modification of stop orders. This function is testing stage. It is recommended to use this function on a separate account in parallel with the same EA that does not use this function. Eventually, you will be able to compare the results. Everything is relative.